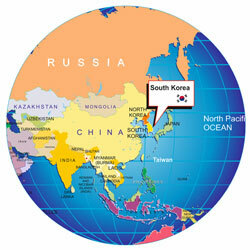 North Korea | Flag Nort Korea | Map North Korea | Where is North orea? The Democratic People's Republic of Korea, called North Korea in common parlance, is bounded by China, the Sea of Japan, the Yellow Sea and South Korea. 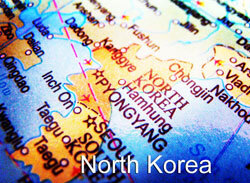 After the World War II, Korea was split with the northern half coming under Soviet-sponsored Communist rule. North Korea, under its founder President KIM Il-so'ng, fought a war with South Korea. He was succeeded by his son, the current head of state KIM Jong Il. KIM Jong Il, officially selected as his father's successor in 1980, assumed a growing political role till his father’s death in 1994. Topography of North Korea is mostly characterized by hills and low mountains and a small area of cultivable land. Pyongyang, North Korea's capital, came into existence after the Korean War. This beautiful city boasts wide avenues, neatly designed parks and many marble public buildings. The Juche Tower, the Palace of Culture, the Grand Theater and the Ongrui Restaurant reflect the Korean variant of Communist architecture. The Gates of Pyongyang and the Arch of Triumph, built in honour of Kim Il-Sung's 70th birthday, are truly impressive. Kaesong, six hours from Pyongyang, is home to many ancient buildings that bear eloquent testimony to Korea's five-century-old imperial history. The town is surrounded by wonderful pine-covered hills. Kumgangsan is the country's largest national park, consisting of a range of mountains (known as 'the Diamond Mountain') along the east coast of the country. It should be noted that Independent tourism is not permissible. Only those travel companies officially recognized by the North Korean authorities are permitted to bring tourists to Korea.